There was no master overall plan or vision when I began the garden. A few small clumps of plants and an occasional solitary shrub were scattered here and there across the property when I bought it. I added new material to integrate with what already existed, new beds and plantings growing up around the original inhabitants. The previous owner planted a clump of phlox to mark the location of the septic tank south of the house. I moved it to another area of the yard and it became of the backbone of something now resembling a perennial/crabgrass border. Two lone peonies awkwardly placed served as anchors I kept adding to and eventually a long serpentine peony bed was born. The various plantings began to reach each other and a rough outline of a garden began to emerge, albeit very free flowing and not well defined. Eventually I plan to design proper “rooms” with hedges and architecture to provide a proper setting for my plants, but in the meantime, it was in sore need of some quick fixes to add height and structure. The first such element to enter was an obelisk. An open metalwork structure, it has that classic Washington Monument silhouette I associate with obelisks. We had admired one very similar at a friend’s house. Planted in the middle distance from their terrace it drew one’s eye back across the property towards the spot it stood on a small hillock. Ours was placed in the daffodil circle. The daffodil circle was a good example of something inherited with the property that had to be dealt with. In spring it delighted me with loads of ice follies daffodils, but by May, it was just a slightly irregular raised circle edged in stone that held some scraggly saplings and weeds. Instead of pulling up the stones and mowing over the daffodils, we inserted the obelisk in the center, outlined the circle with boxwood, and allowed a native vine to begin growing up the obelisk. A new focal point for that section of the garden was created. Another area of the garden was transformed by an unplanned acquisition. A friend was moving to California, and I bought some of his garden ornaments. I ended up with, among other things, four seven-foot tall…. well, seven foot tall “something or others”. They looked like a cross between a trellis and an obelisk. They were open and columnar, with small finials on top. I could have just called them obelisks I suppose, but as they were in sight of the first obelisk, which was just so obelisk-y, it just didn’t seem right. The word trellis didn’t seem appropriate, either. They didn’t look like what I thought of when I heard the word “trellis”. Whatever they were, I put them in a formal area of the garden and planted fall blooming clematis under them. Within a season or two, I didn’t have to worry about what they were technically called. The clematis thrived, grew up through the structures, covering them almost entirely. I simply referred to them as my clematis, and left it at that, forgetting about what they were growing on. My happy clematis A number of years later, I was fortunate enough to be included in a book “Gardens of the Hudson Valley”. It was all a happy accident, and a different story. As part of the process, two writers who were doing the text for the book came by to see the garden and meet me. The two women, Susan Lowry and Nancy Berner were very down to earth, intelligent, and personable. Sometime later I received a draft of the copy written for the section on my garden, which I read with great interest. They managed to make my garden, an undeniably “amateur” effort, sound both well thought out and skillfully planned. I could see few edits or corrections. Then something jumped out at me. The clematis things and the obelisk were both described in the text as “tuteurs”. Tuteurs? Surely that was a mistake of some sort. What was a “tuteur”? I looked up the word. 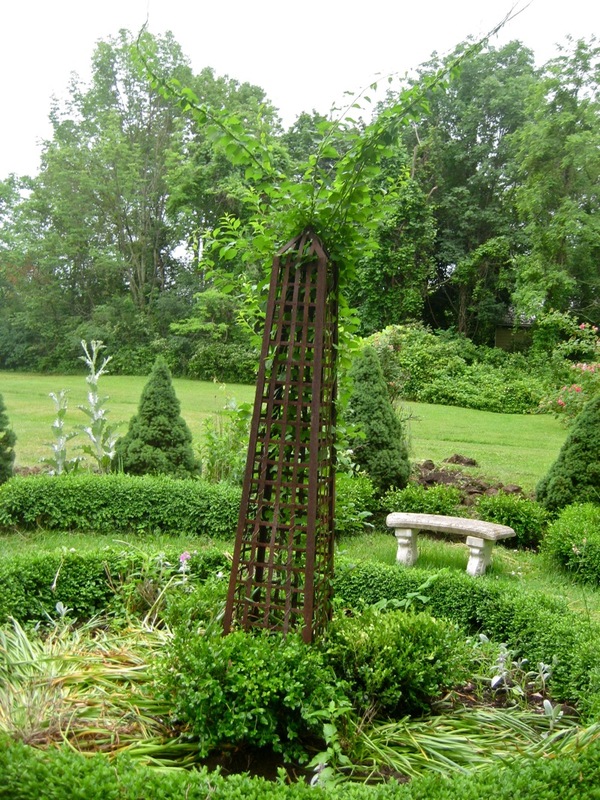 According to the dictionary, a tuteur is “a four-sided pyramid- or obelisk-like trellis designed to help train climbing plants”. Wow! My dilemma of what to call the clematis trellis things was solved! Given my inferiority complex about gardening amidst my expert friends and neighbors, I was happy and excited to have someone elevate my efforts by lending some soigné elements in my garden. “ My clematis are so happy growing on their tuteurs”, requires me to slow down the end of the sentence so much it sounded as if I was running out of gas and putting on airs at the same time. Saying it at normal speed with my naturally sloppy annunciation, and suddenly my clematis were growing on “Tudors”. Trying it again, hitting the middle “t” sound, out came “tooter”. That’s when the real trouble began. Every time I hear anything resembling the word “tooter”, my mind immediately jumps to Tillie Tooter, the elderly grandmother in Florida who ran off the road and was trapped in an overturned car in a mangrove swamp. She survived for three days before being found by sucking the moisture out of her golf socks each morning. Although I have nothing but admiration for that plucky little lady, she really didn’t need to enter into my mind every time I looked at, or tried talk about my tuteurs (for more on her story of courage and survival, you can go to this link http://articles.sun-sentinel.com/2010-08-07/news/fl-tillie-tooter-profile-20100806_1_lori-simms-mangroves-seat-belt#.T5AaAGvbJpY.email). In additional the linguistic pitfalls of my newly minted tutuers, the clematis on them were creating a more pressing issue. In their lust for life, they kept growing, up and out of their respective tuteur’s framework, and towards each other. Eventually, each pair closest to each other started to embrace. At first, errant tendrils would simply caress each other, eventually intertwining, which I found charming. Within a year, they were locked in a Samoan death grip. As the clematis clutched each other, they began twisting the light metal framework of the tuteurs, pulling them from their bases. What had a year or two before had resembled shaggy green columns, was now beginning to look like a car wreck. I thought, “What would Tillie Tooter have done? teetering tuteurs Meanwhile back at the Daffodil Circle Ranch, things were taking a different, but equally disturbing turn. Each year after the daffodil greens died back, I planted annuals to fill the void. Nothing ever seemed to take though. Unlike the annuals, the native vine that took root and was growing up through the inside of the obelisk seemed to be thriving. I had envisioned its leaves poking out through the open latticework, which some did, but the overall impression they gave was as if they were shooting through the top of the obelisk. I decided to forgo so many flowers and add some box within the circle. I started with two large ones, planted towards the center of the circle, and added a few additional smaller ones scattered on the edges. For a brief time the box looked happy, the vine looked happy, and I was happy with the new composition. Then one day I looked twice at it, and it seemed, well, a little TOO happy. The larger circular box planted around the base of the obelisks shaft, coupled with the green vines shooting from its top, lent the whole planting the appearance of a very excited Jolly Green Giant’s privates. No matter how many times I moved the box, at some angle, it all looked phallic. I tried taking one away, and the other box ball looked silly hanging out on its own. I then added a third box ball, and I had something that looked like it belonged in a sideshow at Coney Island. The peace and serenity of my garden was being destroyed by visions of inverted grandmothers, randy obelisks, and tuteur-eating clematis. Drastic measures were called for. I addressed the obelisk phallus first, in hopes of regaining a pg-13 rating for the garden. The vine was pulled out with little remorse, as it was technically a weed anyway. I removed the obelisk from the bed and its boxwood surroundings, replacing it with a chaste urn. It ended up in another area of the yard happy enough, if a little gelded. The tottering tuteurs required a slightly more imaginative approach. I added two long metal poles connecting the tops of the tuteurs diagonally opposite each other. Shorter metal poles were attached between the two pairs closest. I hope the added tension and structure would counterbalance the tendency of the plants to pull towards each other. I did it all asymmetrically, and although the new metal pole attachments create a slightly jarring note against the existing tuteurs, I know the clematis vines’ rapid growth will hide all the unsightly framework in very short order. In the meantime, I realized I no longer had four individual “four-sided pyramid- or obelisk-like trellises designed to help train climbing plants”, but one, singular “arbor”. An arbor it is, and shall remain. It’s a perfectly pronounceable word, with absolutely no tangential associations. My “tuteurs”, with all their linguistic traps and mental snares, will hopefully soon be just a memory.